REYKJAVIK, Iceland, March 20, 2019 /PRNewswire/ -- Borgun, a European payment processor and merchant acquirer, has signed an agreement with the fintech and insurtech company novae to support its digital transformation. Borgun and novae aim to co-create solutions in a digital capability framework (DCF) developed by novae that leverages invisible payments, digital currency, embedded travel-related benefits, push payments and other technologies aimed at improving and expanding payment and rewards options for Borgun's bank and merchant clients while enhancing the customer experience. The DCF will feature a user-centric, universal, cross-border, all-digital, mobile-first loyalty platform that enables bank consumers and merchants to redeem points anytime, anywhere (online and in-store), from any device (mobile, desktop or wearable) and using any payment method (credit, debit, points or split payment). 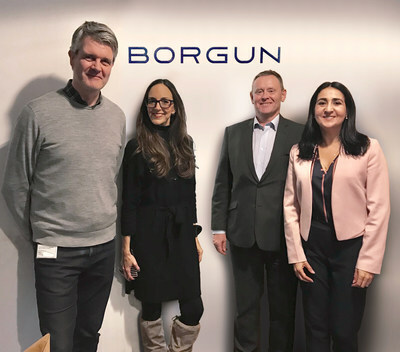 "Through our partnership with novae, Borgun is excited to harness online and mobile tools that will take customer benefits and the customer experience to the next level," said Sæmundur Sæmundsson, Borgun's CEO. "novae is honored to have the opportunity to work with such an industry leader as Borgun to support its digital transformation," said Sergio Arana, novae's CEO and Head of Ventures. Thanks to novae's single, smart payment solution on an invisible and securely encrypted payment platform, Borgun clients will be able to manage rewards as digital currency that can be used alone or split with other payment methods, such as credit or debit cards registered on the platform, to make payments online and contactless in-store around the world. "Borgun intends to leverage the powerful solution novae is creating with us not only in Iceland, but also in the UK, Hungary, the Czech Republic and other markets where our company operates," said Pétur Fridriksson, Borgun's General Manager, Card Services and Business Development. "novae's alliance with Borgun is an exciting one, and this is only the beginning. Iceland will be our gateway for expansion throughout Europe," said Adriana P. Sanchez Krieger, novae's Head of Europe. Finally, by integrating machine learning and artificial intelligence capabilities, novae's platform will help Borgun better understand the interactions and purchase behaviors of its clients to proactively present increasingly relevant offers. Leveraging novae's Hum/bot technology, Borgun will seamlessly combine AI-powered customer interactions when speed is the priority with human interactions when preferred, as well as provide support to customers in the messaging channels they use every day. Founded in 1980, Borgun was the first issuer and acquirer of credit cards in Iceland, providing acquiring services to merchants in six countries in Europe. It offers a comprehensive range of simple, secure payment processing solutions that can be tailored to fit specific business needs. Borgun is a member of Visa Inc. and MasterCard International and has exclusive agreements with JCB, Diners / Discover, Union Pay and American Express. Borgun is a licensed financial institution regulated by Iceland's Financial Supervisory Authority. For more information, visit us at borgun.com or write borgun@borgun.is. novae improves the customer experience through technologies and services that make mobile transactions, communications and other business-consumer interactions faster, easier, more effective and more enjoyable. Headquartered in San Francisco and with a business and innovation hub in Miami, an insurtech hub in London and shared services centers in Buenos Aires and Bogotá, novae has clients across the Americas and Europe. novae is part of a&a Co, a global equity investment company based in San Francisco and focused on creating, acquiring and investing in artificial intelligence (AI), mobile services and payments/loyalty ventures. novae's strategic partners include Visa, CyberSource, Canopius Syndicate at Lloyd's, Expedia and AAXIS. Investors in novae include the private debt and equity capital funds CASEIF III LP and ExWorks Capital LLC. For more information, visit us at wearenovae.com or on Twitter or LinkedIn.